I had a post all set to go for today. It wasn't this car. As I mentioned in an earlier post, it's my habit to turn on my computer and check my e-mail before I go to bed. Sometimes, if I have no e-mails to reply to, I'll prowl around eBay Motors, AutoTrader.com, or Craigslist, looking for something to write about the next day. Something I find on a Wednesday night would usually get posted on Friday. Once in awhile something turns up that is so cool I feel compelled to write about it and post it immediately. This is one of those cases. I wrote about an R17 in an earlier post. I titled it the "Renault you want to own". It really is. I know. I owned 2. This car appears to a very nice driver and one that with little effort could become a show car. ("Show car" is a relative term. You won't win any awards at any major events, the car just isn't worth much, but you'll get a lot of attention at local and regional European car shows.) The body has a few dings, a badly located aftermarket antenna and some "microscopic" rust, but the interior and drivetrain are in great shape. It's a perfect car to do a rolling restoration on. As I said in my original post, if you don't care what people think about the "name" on your car, if you don't care what it's resale value is and if you don't mind hunting down parts, the R17 is a really unique and fun car to own. Click here to see the eBay listing for this R17 Gordini. You can find my original R17 post here. This is my 1975 Gordini (the other was a '79). 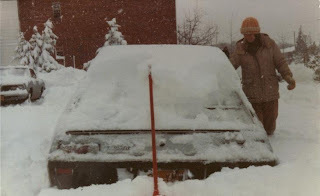 The picture was taken in the early 1980s after a serious blizzard. The girl in the picture was a neighbor, who was helping me clean off the car. Love it, fantastic looking car, would look at home in a 70's SciFi movie. At $5600 it would appear someone got a bargain! Geez it sold for $5600.00. I had it for a $2500.00 car. I figured it was going to go for around $3000.00 - $5600.00 is huge money for this car. Maybe, finally, they're getting a certain amount of respect. I had a black 79 model that I drove the wheels off of. The dodge challengers and chevy camaros that I egged on to race saw nothing but my tail lights. It truly was a quick little car. I had a 1978 just like the one pictured. Was a fun car and the report from JACG is right on. I called the car "Ricardo Montalban" after the cool red seats in the car.